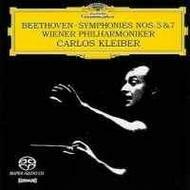 In Carlos Kleiber's hands the first movement of the Fifth is electrifying but still has a hushed intensity. The slow movement is tender and delicate, with dynamic contrasts underlined but not exaggerated. In the Scherzo, the horns (like the rest of the VPO) are in superb form; the finale then emerges into pure daylight. In Kleiber's Seventh, symphonic argument never yields to the charm of the dance. Incisively dramatic, his approach relies on sharp dynamic contrasts and thrustful rhythms. [...] The latest digital remastering has again greatly improved the sound, especially on SACD.